Send a free printed postcard to US military personnel stationed overseas showing your support and appreciation for their service to our country. Visit www.letssaythanks.com to send a free card. Pollo Campero, a Latin American chicken restaurant chain, opened on Wednesday, December 17th. The restaurant, located at 18660 S. Dixie Hwy.,features a variety of chicken dishes. Check out their website at www.pollocampero.com. If you have an old TV and still use an antenna, you must get a converter box before February 17th in order to get TV reception. Apply online before December 31st to receive your coupon good for $40 off the cost of a converter box for your TV. Visit www.dtv2009.gov for details. There are many beautiful light displays throughout our community. The following is a list of area displays recommended by the Miami Herald. CUTLER BAY: 8281 SW 186th St.; 19281 Holiday Rd. ; and 8740 SW 186th St.
PALMETTO BAY: 9335 SW 176th St.
PINECREST: 6840 SW 119th St. www.clotxmas.com and 10401 SW 60th Ave. THE REDLANDS: 26480 SW 187th Ave.
On December 27th at 6:30 pm. The movie, "Alvin & The Chipmunks" will be the featured film at Coral Reef Park. The Miami-Dade Community Image Advisory Board invites you to design a poster to "Clean Up and Green Up" our community. The contest is open to students in K-12. First place winners receive a Nintendo Wii. For more information visit miamidade.gov/image. Saturday, December 13th and December 20th, from 10am to noon. Children of all ages are invited to listen as Santa Claus reads some classic holiday stories next to the Christmas Tree at the Deering Estate's Stone House Ballroom. After story time, children are invited to participate in an arts and crafts activity. Bring your camera and get a picture of your child with Santa or have one done professionally for an additional fee. General admission to the Deering Estate is $10 for adults and $5 for children (ages 4-14). For more information visit www.deeringestate.org. On Sunday, December 21st, at 10 am, join Life Church as they celebrate the joy of the season with Christmas music, hot chocolate, homemade cookies, and a birthday party for Jesus for children 12 and under complete with pinatas, party bags and cake. Listen to the Christmas message "Handling Life's Changes". The event takes place inside Regal Cinema, Southland Mall. For more information, visit lifechurchmiami.org or phone 305-235-8411. In addition, Donate a toy to “Toys for Tots” and Life Church will wrap your Christmas presents for free . Visit their kiosk at Southland Mall. On Sunday, December 21st, from 2-4pm (arrive by 1:30). Take a cruise on the "Pelican Island Skipper", a 45-foot catamaran, as you explore the waters of Biscayne Bay. Learn about birds, sea mammals, Native Americans and early pioneers. The cruise is open to all ages at a cost of $35.00 per person. To reserve your space call 305-235-1668 ext. 233. For more information visit www.deeringestate.org. December 22nd, from 3:30-4:30 pm. Visit the South Dade Regional Library where children from first grade and up can enjoy holiday stories and crafts. Early voting is underway for the Dec 16th runoff for Miami-Dade County's new elected property appraiser post. The runoff is between Gwen Margolis and Pedro Garcia Jr. For early voting locations and times visit www.miamidade.gov/elections/vote_early.asp. December 18th, from 7-8pm. Visit South Dade Regional Library to find out more about whitefly, which is killing ficus hedges thoroughout South Dade and discover alternative low-maintenance hedges. On Saturday, December 13th, from 1:00-3:00pm, visit Southland Mall's Center Court to meet Frosty the Snowman. Enjoy holiday games and prizes, hair beading, temporary tattoos, and holiday crafts. There will also be a drawing to win a bike. This Saturday, December 13th, starting at 7pm. Join your neighbors in celebrating the 14th Annual Cutler Ridge Boat parade. The parade takes place along the Bel-Aire Canal in Cutler Bay. Residents can get a good view of the parade from the Marlin Rd bridge (at Bel Aire Drive), or the foot bridge located at Bel Aire Drive and Cutler Ridge Drive (near Cutler Ridge Park). See the map for locations. On Saturday, December 13th, beginning at 7:30pm (doors open at 7pm), enjoy an evening filled with the sights and sounds of spirited Christmas music performed by an array of talented musicians from The Old Cutler Choir & Orchestra, the brand new Old Cutler Children's Choir and more. This free concert takes place at Old Cutler Presbyterian Church, located at 14401 Old Cutler Rd. For more information, visit. Saturday, December 13th from 1-4 pm. Visit the Miami Science Museum for a fun filled day of entertainment. Enjoy performances by the New World Symphony, New World School of the Arts, Country Pop Sensation Nicole Patrick, Cane Records and Gospel/Blues Artist Maryell Epps. There will be special giveaways and Hannah Montana centered activities along with science demonstrations and holiday sing alongs. For additional information about the museum, visit www.miamisci.org or call 305-646-4200. The Miami Science Museum is located at 3280 South Miami Avenue. Sundays from 9am-4pm, November through April. Palmetto Bay's Farmers Market will feature fresh vegetables and fruits from local growers, arts & crafts, plants, antiques and collectibles. It's a great place to find fresh locally grown produce while being environmentally responsible. The Market is located on Franjo Road (Perrine Ave) just north of US-1 within the US-1 island area (between Banyan St and Datura St) map . Read the Miami Herald article for more information. Knaus Berry Farm opened on Tuesday, November 11th. Enjoy fresh produce, baked goods, milkshakes, and more. Hours are 8am-5:30 pm, Monday-Saturday. Knaus Berry Farm is located at 15980 SW 248th Street, in the Redlands. Phone 305-247-0668 for more information, or visit. Do The Right Thing of Miami, Inc. is a non-profit organization which recognizes and rewards children for positive behavior, accomplishments and good deeds. Since its inception in July 1990, the program has directly impacted over 170,000 students in Miami-Dade County alone. This program has been selected by Allstate as one of three charities in Miami-Dade County to be eligible to win a $15,000 prize. Go to www.allstateyourchoicecharity.com and vote daily through December 10th and help support this important children's organization. Friday, December 5th from 7 pm – 9 pm (gates open at 6) Kick off the Holiday season with the Deering Estate's annual Tree lighting ceremony in the historic Stone House Ballroom. Enjoy live performances of your favorite holiday music. General admission to the Deering Estate is $10 for adults and $5 for children (ages 4-14). For more information, visit. Saturday, December 6th from 7-10pm (gates open at 6). Bring your blankets, lawn chairs and small picnic baskets and enjoy this outdoor concert. Tour the historic houses beautifully decorated for the season. Ticket prices are $20 for adults and $10 for children ages 4-14. For tickets or additional information, call 305-235-1668 ext. 233. December 6th from 9am to 8pm and December 7th from 8am to 8pm. This event features approximately forty vendors of arts and crafts, gifts and baked goods. The church is located at, 11291 SW 142nd Ave. For additional information, call 305-408-9935. On December 6th and 7th, from 11am-6pm. Visit Dolphin Stadium for South Florida Parentings Holiday show. This event has boasts over 200 activities including a snow play area, snow tubing hill, music, face painters, bowling, Dolphins Jr. training camp, batting in the Marlin's batting cage, paddle boats, pony rides, rock wall, mechanical bull, visits with Santa and much more. Admission is $10 per adult or child over 18 months. Dolphin Stadium is located at 2269 NW 199 Street. For more information call 800-244-8447 or visit. December 7th from noon to 6pm. Shop for jewelry, handbags, ceramics, housewares, gifts and toys. Bet Shira temple is located at 7500 SW 120th St, in Pinecrest. For more information call 305-238-2601. November 27th from 8:30am to noon. Volunteers are needed on Thanksgiving Day to help deliver over 3000 hot meals to needy South Florida residents. Volunteers locations include Perrine Peters United Methodist Church. To volunteer or to make a donation, call 305-442-8306 or donate online at www.sflum.org. Saturday, November 29th, from 1pm-3pm. Enjoy milk and cookies with Santa and hear a special reading of "Twas the Night Before Christmas". Play games and win prizes while enjoying balloon art, face painting and crafts. For more information phone 305-235-8880. On November 29th, from 10am-4pm, visit Cauley Square where over 20 vendors will display hand made crafts for the holidays. Cauley Square is located at 22400 Old Dixie Hwy. Phone 305-258-3543 or visit their website for more information. November 21st-23rd from 11am to 11pm. Visit St. Andrew Greek Orthodox Church for their annual Greek Festival. The event is free. The church is located at 7901 North Kendall Dr. For more information, call 305-595-1343. Saturday, November 22nd, 5:00pm to closing. Visit Black Point Ocean Grill for a benefit featuring 6 bands, raffles and a silent auction. The benefit is to support Soldiers' Angels a non-profit organization supporting our military service personnel and our veterans. Funds raised during this event will aid the Miami VA Hospital through Soldiers' Angels. Bands featured at the event include, Ron Gross, Fire Brigade, The Reggs, Instant Replay, Ego, and John Allen And His All-star Band featuring Back Track and Janice. Black Point Ocean Grill is located at Black Point Marina, 24775 SW 87th Avenue. For additional information, phone 305-258-3918. Saturday, November 22nd from 11am to 3pm, visit Amy's Hallmark Store at 14765 S. Dixie Hwy for an event featuring artwork by talented young artist 12-year old Macki Alverez-Mena. Proceeds from the sale of her tote bags and stationery will be donated to help build a school in Haiti. For more information about the fundraiser, phone 305-232-5559. To see some of Macki & Company's designs, visit her website at www.mackiandcompany.com. On November 18th-22nd, visit Miami Dade College for a variety of events including a golf and Softball tourney, artists, gospel concert and Carnival. For information, times and exact locations, visit or call 305-237-2321. Saturday, November 22nd, starting at 4pm. Visit the Falls shopping center this Saturday for their 12th annual "Miracle on 136th Street" Parade. Enjoy a variety of bands, costumed characters, local officials, and Santa Claus. Post-parade entertainment includes Brazilian dancers, "The Nutcracker" presentation, a youth choir, and a performance by Disney's Camp Rock star Meaghan Jette Martin. The parade is free. Be prepared to arrive early for the best views. The Falls is located at 8888 SW 136th St.
"As long as the campaign signs are cardboard or corrugated plastic (not plastic bags), residents may put their recycling signs in their new, blue recycling carts!" We want to thank Cutler Bay resident, Chris Rose, Deputy Director- Administration, with Miami-Dade's Department of Solid Waste Management for sharing this important tip. Beginning Monday, November 3rd through Sunday, November 16th, The Miami-Dade Water and Sewer Department will be using a different method of chlorination at each of its regional water treatment facilities. Any change in the taste of the water is perfectly safe and temporary. On Friday, November 14th, from 8pm-11pm, visit Norman Brothers Produce for their annual wine tasting and open house. Taste dozens of wines from around the world, and enjoy hors d oeuvres and desert. Cost is $25 per person, with the proceeds going to UM/NSU Card (Center for Autism and Related Disabilities) Norman Brothers is located at 7621 SW 87th Ave (Galloway Rd). For more information, read the flyer or call 305-274-9363. On November 15th, get ready for the Hometown Harvest Bike Ride, a 10.3 mile family bike ride through the Town of Cutler Bay. Registration is from 8:00-8:30am. After a childrens safety rodeo at 8:30am, the ride will begin from the Southland Mall parking area closest to Caribbean Blvd. Helmets are required. November 15th. Holy Rosary Catholic Church is located at 18455 Franjo Rd. Call 786-299-9167 for details. November 15th, from 8am to 4pm. Visit Perrine-Peters Methodist Church at 18301 S. Dixie Hwy for their Fall Craft Fair. November 15th and 16th from 10am-5pm. Visit the Redland Fruit and Spice Park for this first time festival showcasing Eco-friendly living including: local and organic farmers market, alternative energy, vehicles and fuels, medicinal herbs, oils and teas, natural foods and culinary plants. Enjoy live musical entertainment, lectures and children's activities. Take advantage of services including aromatherapy, yoga, Tai Chi, Reiki, and chair massages. Admission is $6.00, free for children under 11. Registration is required for all classes. For more information or to register, phone 305-247-5727. The Redland Fruit and Spice Park is located at 24801 SW 187th Ave., in Homestead. Sunday, November 16th. Help the Transplant Foundation by participating in their 5K Walk/Run at Miami Metrozoo. Registration for the event begins at 8am. The timed run begins at 9am with the family walk beginning at 9:05. Pre-registration is $35 for adults, $20 for children. Registration fees are $60 and $30 on-site. Participants receive free breakfast and lunch, t-shirts and more. See the flyer for additional information. This huge week long event features an array of authors discussing their latest books, book signings, and other events culminating in a 2 day street fair. November 9th-14th "Evenings With…" presentations, will require admission tickets which will be available beginning November 5th. For more information, go to www.miamibookfair.com. Many people use the internet or dial 411 to look up phone numbers. Yet each year, countless trees are destroyed producing the paper telephone directories that are delivered to everyone's home. You can help "Save a Tree" by calling AT&T at 1-800-422-1955 and requesting to be put on their “Do Not Deliver” list. Deliveries are taking place in our area this week. Please call today! Tuesday, November 11th from 6 to 8pm. Relay For Life of Palmetto Bay/Cutler Bay will have their kickoff event for the 2009 Relay. Attendees receive registration, volunteer and sponsorship information, free food and activities. The event takes place at the Palmetto Bay Village Center, 18001 Old Cutler Road. The 2009 Relay for Life is set for March 21-22. For additional information regarding the Relay For Life, please contact either Kathia Fermin, American Cancer Society, email or 305.779.2876, or email JoAnn Parns, Event Chair, Relay For Life of Palmetto Bay / Cutler Bay. On November 7th-9th, join in the fun and entertainment of Ribfest 2008. Enjoy hay rides, carnival games, motorcycle rally, classic cars, horse show, arts and crafts and a family fun zone with petting zoos, games and a bounce house. Listen to a variety of artists each day. The event takes place at the Homestead Air Reserve Park, located at Moody Drive (268 St) and SW 122 Ave., in Homestead . Admission and parking are as follows. Friday, $5.00, 11am–10pm. Saturday, $10.00, 11am–10pm., and Sunday $10.00, 11am-6pm. For more information including a list of performers, visit www.miamidade.gov/ribfest or phone 305-233-3150. On November 8th and 9th from 9:30am–4:30pm. This 68th annual event includes: plants for sale, live music, arts and crafts, antiques, old and rare books, plus local food and activities for the kids. The event takes place at Fairchild Tropical Garden, located at 10901 Old Cutler Rd. Admission is $20.00 for adults, $15.00 for seniors, and $10.00 for kids 6-17. Call 305-667-1651 ext. 3344 for additional information, or visit www.fairchildgarden.org. Area Publix, CVS, and Walgreen's stores are now administering flu shots to the public. Prices may vary. See the schedule for more information and other times. November 7th and 8th from 9am-2pm. Visit Christ the King Lutheran Church for their White Elephant sale. The church is located at, 11295 SW 57th Ave., the event is free. For additional information call, 305-665-5063. Saturday, November 8th, from 8am-5pm. Cutler Ridge United Methodist Church will present their annual Country Fair featuring hundreds of Christmas crafts, vendors, children's games, and a bake sale. Enjoy fresh cinnamon rolls and coffee, and a hot dog lunch or a chicken barbecue served from 11am to 4pm for only $5.00. Admission to the fair is free. Cutler Ridge United Methodist Church is located at 20740 Old Cutler Road (intersection of Old Cutler Rd and Marlin Rd). For more information, call 305-233-7457. Saturday November 8th from 9am-3pm. Visit St Thomas Lutheran Church for their holiday fair featuring crafts, a rummage sale and delicious baked goods. St Thomas Church is located at 17700 Old Cutler Road, in Palmetto Bay. Holy Rosary’s Annual Blue Mass will be held on Saturday November 8th at 10:00am in honor and thankgiving to the Law Enforcement Officials, Firefighters, and Emergency Medical Services (EMS) personnel of our community. Holy Rosary Catholic Church is located at 9500 SW 184th St.
Saturday, November 8th. Visit the Deering Estate for its annual "Fall in Love" concert featuring Patti Austin and Gerald Albright. The gate opens at 5pm and the concert begins at 7pm. Guests are encouraged to bring blankets, lawn chairs and picnic baskets; no coolers please. Beverages and food will be available for purchase. Tickets are $40 in advance and $45 at the gate. For more information call the ticket office at 305-235-1668 ext.233. Get information about absentee ballots, sample ballots, early voting, and more by visiting our elections page. Politicians sometimes misstate facts either in error or deliberately. Check their statements yourself by visiting, www.factcheck.org. Saturday, November 1st and Sunday, November 2nd, from 9:30am to 4:30pm, come to the South Florida Palm Society Sale. Expert growers will be available to answer your questions. This event takes place at Fairchild Tropical Garden, located at 10901 Old Cutler Road. Call 305-667-1651 for details. Sunday, November 2nd from 9am to 4pm and every Sunday through April. Palmetto Bay's new open air farmer's market will feature fresh vegetables and fruits from local growers, arts & crafts, plants, antiques and collectibles. It's a great place to find fresh locally grown produce while being environmentally responsible. The Market will be located on Franjo Road (Perrine Ave) just north of US-1 within the US-1 island area (between Banyan St and Datura St) map . Read the Miami Herald article for more information. At Cutler Ridge Park on Friday, October 31st ,from 5-9pm. Enjoy the haunted house, carnival games, hayride, costume contest, food, and more. Call 305-284-4166 for more information. Cutler Ridge Park is located 10100 SW 200 St.
October 24, 25, 26 & 31, from 5-10 pm. Visit the Miami Seaquarium for their biggest, scariest, kid-friendly, halloween extravaganza. Enjoy halloween shows, haunted houses, rides and slides, with fireworks at the end. Admission is $24.95 for adults and $21.95 for children ages 3-12 The Seaquarium is located at 4400 Rickenbacker Causeway Key Biscayne. For additional information call 305-361-5705 or visit. Open to grades 9-12. Complete an essay which explains: What civic value do you believe is most essential to being an American? Prizes up to $5,000 and a trip to Washington DC will be awarded. For more information, visit beinganamerican.org. Cutler Bay is home to a variety of birds, among them a Pink Flamingo which was spotted this Monday at the Cutler Bay Wetlands Conservation area, located just off Old Cutler Road, at SW 224th Street and 97th Ave (map). Bring your camera and binoculars, and with luck you can see him/her for yourself. You can also visit the Tropical Audubon forum,and clink on the link “Greater Flamingo” for photographs taken on Monday, October 13th. Miami Dade County is moving to single stream recycling. Cutler Bay residents should be getting new recycling containers this week. These blue bins resemble smaller versions of the green trash containers. With the new program, residents will be able to recycle more items with no need to separate newspapers from bottles and cans. Pick-ups will occur every other week. Smaller 35 gal carts as well as larger 95 gal carts are available by calling 311. For more information about what can and can not be recycled, pickup schedules, and a list of frequently asked questions, visit www.miamidade.gov/dswm/new_curbside_recycling.asp. Tuesday, October 28, 7pm. Celebrate Halloween with Stories and Crafts at the South Dade Regional Library. Fun for the whole family. October 25th, from 9am to 3pm. This sixth annual event features handmade quilts, wood items, Christmas ornaments, jewelry, stained glass, shell crafts, angels made from old hymnals and other handmade items. Lunch and delicious baked goods both available for purchase. The event is free, Vendor fee is $35. The church is located at, 7190 SW 72nd. For more information call 305-665-2562. October 25th and 26th. Visit Jungle Island for a weekend of chills, thrills and fun for the whole family. Join in the Islands Halloween Costume contest, trick or treats and spectacular animal show along with a Wii Tournament, live DJ, face painting, arts and crafts. Call 305-400-7000 for additional information. Saturday, October 25 from 9:30 am to 4:30 pm. Visit Fairchild Tropical Gardens and learn about how to plant your own edible vegetable garden. Fairchild Tropical Gardens is located at 10901 Old Cutler Road. Saturday, October 25, 1pm. Visit the Center Court at Southland Mall for a chance to come face to face with the most amazing and exotic animals. Learn about these amazing creatures a get a chance to hold one. Sunday October 26, from 9:30 am to 4:30 pm. Fairchild Tropical Gardens will be holding their Family Harvest Day event. Kids will enjoy creating their own decorations, listening to ghost stories and playing games. Fairchild Tropical Gardens is located at 10901 Old Cutler Road. Saturday, October 25th and 26th, from 10am-5pm. Don't miss the Cultural Council's 18th annual "In The Park With Art", at Coral Reef Park. Enjoy the art work of over 100 artists that participate in this juried, award-winning fine art show. The event features music, face painting, children's crafts, plants, and great food. Take a chance at winning one of many wonderful prizes. Admission is free. The event takes place at Coral Reef Park, located at SW 152nd Street and 77th Ave. Parking is free at the park. Additional parking available across the street at St. Richards Church. You can also park at St. Andrews Church on Old Cutler Road and 144th Street, and take the Ibus for free (12-5). For more information visit www.culture-council.org or call 305-238-0703. October 25th, 7-9:30 pm. Learn about scary nighttime critters and then search for them on the nature trail after dark with park naturalists. Afterwards, enjoy a campfire, marshmallow roast and star viewing with members of the Southern Cross Astronomical Society. This event takes place at Bill Sadowski Park located at 17555 SW 79 Ave. Reservations are required. To make reservations or for additional information call 305-255-4767 or visit. Saturday, October 25th and Sunday, October 26th from 11am-4pm. Kids 12 and under are invited to join in the fun as Metrozoo celebrates Halloween with their annual trick- or-treat event. Participate in costume contests, make halloween crafts and enjoy special performances. Miami Metrozoo is located at 12400 SW 152 street. General Zoo Admission is: $15.95 per Adult and $11.95 per Child (3-12). Free for children under two, and Zoological Society of Florida members. For more information please visit www.miamimetrozoo.com. October 25 and 26 from 6:00 pm - 9:00 pm. Join the fun as the Gold Coast Railroad Museum presents their Spooky Halloween adventures for children 10 and under. Enjoy live entertainment, a costume contest, Halloween story time, coloring activities, scary videos, games and trick-or- treating. Don't forget to take a free ride on the haunted train! Cost is $6.00 for museum members. Nonmembers pay $7.00 in advance, $9.00 at the gate. Rides on small train to S'more station are an additional $2.50. Call 305-253-0063 Tuesday-Friday for additional information and advanced sale. No refunds for advanced sale tickets. The National Parks Conservation Association invites you to a celebration for Biscayne National Park’s 40th Anniversary. Join in this day-long celebration and enlivening discussion on the largest marine park in the National Park System. The event takes place on Saturday, October 18th, from 8:30am-3:30pm at the Deering Estate, located at 16701 SW 72nd Ave. Admission is $15 and includes breakfast, lunch and park entrance. RSVP by October 9th by calling 305-235-1668, ext.233. For more information, read the flyer and the fact sheet. Saturday October 18th from 7pm-11 pm. The Rotary Club will host it's Bootleggers Casino Night at the Palmetto Bay Village Center. Enjoy hors d'oeuvres and drinks while experiencing the excitement of casino gaming set to a 1920's theme. Tickets are $50 each, redeemable for 50 gaming fun chips. Palmetto Bay Village Center is located at SW 184th St. and Old Cutler Road. Proceeds benefit the Perrine Cutler Ridge Rotary Foundation. For additional information or to purchase tickets, call 305-446-0702. On Saturday, October 18th from 9am-5pm. Come to the longest running church craft festival in South Dade. A true South Dade tradition, this family event brings together crafts, jewelry, plants, food, and fun for the whole family. NEW this year is a kids interactive area and farmers market. For more information, call 305-235-5135. Holy Rosary Catholic Church is located at the corner of Franjo Road and 184th Street. Fairchild Tropical Gardens will be holding a Bonsai Show and Sale on Saturday, October 11th and Sunday, October 12th from 9:30am to 4:30pm. Fairchild Tropical Gardens is located at 10901 Old Cutler Road. On October 10th, from 7:30 to 10pm, visit the Redland Fruit and Spice Park where the Southern Cross Astronomical Society will guide you through a exploration of the heavens. Enjoy music, refreshments and story telling around the campfire. Don't forget to bring a blanket. Admission is $10.00; children under 6 are free. For additional information call 305-247-5727. The park is located at 24801 SW 187th Ave., in Homestead. Friday, October 10th, 7pm. Visit the Stone House Ballroom at the Deering Estate for their Living Artist Concert Series, “Florida Dreams”. Members will perform a new work by composer Judith Shatin along with works by Dohnanyi, Delius and Brahms. General Admission is $35. For more information, visit the Deering Estate website. The last Day to register to vote for the November 4th election is October 6th. Early voting runs from October 20th through November 2nd. Autumn Festival "Planting Seeds For A Safer Tomorrow"
The Miami-Dade Police and Fire Departments invite you to an autumn festival "Planting Seeds For A Safer Tomorrow", on October 4th from 10am-4pm, at 10800 SW 211th St (the Cutler Ridge substation across from Southland Mall). There will be pony rides, free health screenings, a job fair, free raffles (grand prize is a WII game system), complimentary food and beverages, and much more. For more information, read the flyer. Visit the Southland Mall On Sunday, October 5th, from 11am-4pm, and stop by the "Thinking of You Services" table where you can sign a card for our troops overseas or find out how you can help send a care package. The Town Charter currently prohibits the Town from exceeding the Charter- mandated debt limit, and the Town may only levy taxes or appropriate funds by ordinance. It is proposed that the Charter be amended to 1) allow the Town to exceed the debt limit with the electorate’s majority vote and 2) allow the Council by resolution to place general obligation bond issues on the ballot for voter approval. The Town Charter currently does not stipulate that Council Members represent the entire Town, and limits terms of the Mayor, Vice-Mayor, and Council Members holding a single office to eight years, and cumulatively in multiple offices to twelve years. It is proposed that the Charter be amended to require all Council Members to represent the entire Town, and extend the term limits to twelve and sixteen years respectively. The Town Charter currently allows for compensation for Council Members/Vice- Mayor of $500 monthly, and for the Mayor of $1000 monthly, and these salaries increase with the Consumer Price Index (CPI). It is proposed that 1) salaries per month be increased by $500 and $1000 respectively for the Council Members/Vice-Mayor and the Mayor beginning in 2012 and 2) that all compensation for elected officials be tied to the CPI. The Town Charter currently allows for the Town Council to waive competitive bidding by an affirmative vote of four Council Members. It is proposed that the Council may waive competitive bidding by an affirmative vote of a majority plus one of the Council Members present at the meeting. Download part1 and part2 of the budget. On Friday, October 3rd, starting at 7pm, visit the Miami Planetarium for their Laser Show. The night begins with Kids of the Future Laser Party, followed by Laser Halloween at 9pm. Starting at 10pm is The Beatles "Sgt. Peppers Lonely Heart Club Band", Pink Floyd's "A Saucer Full of Secrets" at 11pm and Pink Floyd Animals at Midnight. Admission, which includes laser glasses, is $7 for adults and $4 for children. The Science Museum is located at 3280 S. Miami Ave. Call 305-646-4200 or visit their website for more information. At the first budget hearing on September 9th, the town council corrected an error that had been made in calculating the percentage of salary increase for the Town Manager and Clerk. The Clerk will receive a 6.67% increase, and the Manager will receive at 6.76% increase. In addition, the council lowered their proposed salary increases for employees from 8.5% to 7%. As a component of the county's budget cuts, Mayor Carlos Alvarez and County Manager George Burgess have proposed eliminating some transit bus routes, including several routes that service the Cutler Bay and Palmetto Bay communities (including the #1 and #287 Saga Max routes). For more information, read the Miami Herald article. You can also view which routes would be eliminated, restructured, or have the time between bus runs adjusted under the proposal. Click here to send an email to the County Commission and Transit Department with your concerns. Friday, September 26th, from 8am-noon and Saturday September 27, from 8am-2pm. Cutler Ridge United Methodist Church will be holding a huge indoor flea market. Early morning coffee and a hot dog lunch will be available. The Church is located at 20740 Old Cutler Road. Friday, September 26th and Saturday, September 27th. Support the Florida Blood Center by donating blood for those in need at Regal Theatre, Southland Mall. During the months of August and September (except Sept 14th), visit Fairchild Gardens on Sunday and enjoy free admission. Visit www.fairchildgarden.org for more information. September 20th and 21st from 9:30am-4:30pm. Featuring a large display with on-site experts to help you in your selection. The Aroid family includes Alocasia, Anthurium, Caladium, Philodendron, spathaphyllum and others. Fairchild Garden is located at 10901 Old Cutler Rd. For additional information, visit fairchildgarden.org. Saturday, September 13th from 7-10pm. The Deering Estate presents “The Essence of Spain” a Mediterranean journey featuring fine wine, fine food and fine art. Enjoy the wines of Spain, tapas, and Flamenco music. General admission tickets are $60 for members and $75 for non-members. VIP Tickets are $120 for members and $150 for non-members. To purchase tickets or for additional information, call 305-235-1668 ext 263. Sunday, September 14th, 9:30 am. to 4:30 pm. Fairchild Tropical Garden invites you to bring your cold-nosed friend to enjoy dog-friendly activities like agility and obedience demonstrations, dog massages, CPR demonstrations, lectures and dog-related vendors. All dogs must be pre-registered to attend. You can register by calling 305-663-8091. Admission is free for members and children up to 5 years old, $20 for non-members, $15 for seniors and $10 for children 6-17. In addition, many rules and regulations apply regarding this event. Visit this Fairchild Tropical Garden website for more information. Commissioner Katy Sorenson is sponsoring a resolution at the September 9th Government Operations & Environment Committee meeting to reverse the commission's April decision to move the Urban Development Boundary. The State of Florida has found the county out of compliance with the law, and as such the county could receive severe sanctions from the state. In addition, a long legal battle would waste taxpayers dollars. Commissioner Sorenson has consistently voted against moving the UDB, and has been an advocate for smart growth. You can use one of following the email links email1, email2, to send a prewritten note to the the GOE committee members and the other members of the county commission, and ask them to reverse their decision to move the UDB (Committee Chair Natacha Seijas is not available by email but can be contacted by phone: 305-375-4831, or fax: 305-375-2011). Ballots on the 19 proposed amendments to the Cutler Bay town charter must be received by Thursday September 18th. Ballots can be mailed in or dropped in the ballot box at Town Hall, located at 10720 Caribbean Blvd, Suite 105. If you did not receive a ballot, contact Town Hall at 305-234-4262. Read the complete list of ballot questions here. Registered voters in Cutler Bay should start receiving ballots in the mail for a special mail-out election to vote on 19 proposed amendments to the Cutler Bay town charter. The ballots were mailed out starting on August 27, 2008, and must be returned by September 18, 2008. Read the complete list of ballot questions here. Discuss the questions and give your opinion on our forum. On Saturday, September 13th, from 9am-noon, the Miami-Dade Adopt-A-Tree program will be having their last tree give-a-way for the year at the Harris Field Barn Pavilion. Harris Field is located at 1034 NE 8 Street, in Homestead. Trees for this event include Inkwood, Jamaica Dogwood, Lancepod, Sugar Apple and Avocado. Participants must bring a valid picture ID. For more information or for other Adopt-A-Tree dates and locations, call 305-372-6555, 311, or visit the Adopt-A-Tree website. Want to find out if your child's teacher has been arrested or accused of an ethics violation? Visit this Florida Department of Education website and hope that your child's teacher didn't make the list. On Saturday, September 13th, from 10am-5pm. Commissioner Katy Sorenson invites you to attend a Free Foreclosure prevention workshop. Receive one-on-one counseling from experts. The event takes place at the South Dade Regional Library. See the flyer for additional information. September 6th and 7th. Cutler Ridge United Methodist Church is celebrating their 50 Anniversary. On Saturday, September 6th, at 6 pm. There will be a “potluck” international buffet highlighting the cultural diversity of the congregation with a musical program following at 7:30. On Sunday, a dinner will be served following their 10:30 am service. Reservations are required for the Sunday dinner. Cost is $10. for adults, $5. for children 6-12, free for children under 6. Call 305-235-6651 for reservations or additional information. Saturday, September 6 at 1pm. Visit Vizcaya for a day of theater as “Theater by the Book” presents William Shakespeare's, Falstaff and Hal, an adaptation of Henry Fourth, Parts One and Two. The two plays run just under 3 hours. Food will be available for purchase during the halftime intermission. Admission is FREE. For more information, call 305-250-9193 and visit www.vizcayamuseum.org or www.theaterbythebook.org. At the Fruit and Spice Park on September 6th, from 10am-4pm. Learn all aspects of vegetable growing including container gardening, how to grow both conventional and exotic vegetables, planting techniques and practices. Cost is $35.00 and seating is limited. For reservations or additional information, call 305-247-5727. The Fruit and Spice Park is located at 24801 SW 187th Ave. The Concerned Citizens meet on the first Tuesday of the month at 7pm at Cutler Ridge Park. The next meeting is scheduled for September 2nd. These meetings are free and open to all Cutler Bay residents. This months guest speaker will be Cutler Bay Mayor Paul Vrooman. Resident Jenny Reyes will also discuss the elimination of some area bus routes and other changes to the transit system. Miami Dade County is moving to single stream recycling. Cutler Bay residents should be getting new recycling containers at the end of the summer. These blue bins resemble smaller versions of the green trash containers. With the new program, residents will be able to recycle more items with no need to separate newspapers from bottles and cans. Pick-ups will occur every other week. To watch a video of the new program, visit. Visit our elections page for links to the early voting schedule, sample ballot, and voting precinct locations, including a new Cutler Bay precinct. For a video demonstration of Miami-Dade's new optical scan voting system, visit www.miamidade.gov/elections/voting_system_demo.asp. Saturday, August 30th, at 8pm (gates open at 7). The Deering Estate hosts the final concert of their Summer Cabaret Series, featuring jazz vocalist Dana Paul performing “Moments of My Life” and “A Tribute to Gershwin.” Guests can bring refreshments and snacks to enjoy during the show. To purchase tickets ($20), or for more information, please call 305-235-1668 ext. 233, or visit deeringestate.org. The Deering Estate is located at 16701 SW 72 Avenue, in Palmetto Bay. Effective September 1st, pennies will no longer be accepted at Metrobus fare boxes. In addition, beginning October 1st, Miami-Dade Transit will no longer sell tokens, but they will continue to accept them as fare payment until January 31, 2009. For more information visit, www.miamidade.gov/transit/fares1.asp. On May 20th, the Miami-Dade Commission adopted an ordinance that entitles domestic partners visitation rights at health care, correctional and juvenile facilities, along with other benefits. To access these rights, domestic partners must register with Miami-Dade County. Registration begins Monday, August 18th at 10am. Visit http://www.miamidade.gov/csd/domestic_partner_faq.asp for more information. Watch videos of 2 upcoming South Florida Water management District (SFWMD) flow way projects affecting the Cutler Bay area. Get back into cycling. Meet other local cyclists while enjoying a leisurely weekend ride. This group ride is for beginners and for people returning to cycling after a long absence. Ride at 10-12 miles per hour, mostly throughout Cutler Bay, Pinecrest, Old Cutler Road and Homestead on bike paths and sidewalks with low traffic. The group meets on Saturdays at 8am at various locations in Cutler Bay and Palmetto Bay. There are no costs associated to ride. For additional information, contact Manny at 305-283-3413 or visit bike.meetup.com/338. Whitefly has been spotted in the Cutler Bay area. This pest feeds on the leaves of ficus trees and hedges causing leaf yellowing, defoliation and occasionally the tree's death. For more information, visit www.miamidade.gov/csd/releases/08-07-25-whitefly.asp. For treatment information, visit http://miami-dade.ifas.ufl.edu. See photos of the Cutler Bay Fourth of July celebration at Whispering Pines Park, by visiting http://picasaweb.google.com/cebrerophotography or cutlerbay.net/gallery. All Fourth of July photos taken by Cutler Bay photographer Denise Cebrero. A local family is asking for donations for a yard sale to raise money to pay for medical expenses for their 6 year old son, Daniel Castaneda, who has brain cancer. The yard sale will take place at 11811 SW 173rd St, on Saturday, August 16th from 7am-5pm . Any items you wish to donate to the sale can be dropped off at the above address. Also on August 16th, volunteers will raise money by selling hamburgers and hot dogs outside of the Publix on Old Cutler Road from 11am-5pm and by having a car wash at the Burger King on Old Cutler Road. For more information, read the Miami Herald article or contact Antonio Castaneda at 305-301-4924. On Saturday, August 16th, from 9am-noon, the Miami-Dade Adopt-A-Tree program will be giving away trees at the Miami-Dade County Fair and Exposition. The fairground is located at 11200 SW 24th Street. Trees available on that day include Dahoon Holly, White Geiger, Jackfruit , Mango, and Jaboticaba. Participants must bring a valid picture ID. For more information or for other Adopt-A-Tree dates and locations, call 305-372-6555, 311, or visit the Adopt-A-Tree website. For more movie times, visit. As another step towards a greener Cutler Bay, the Cutler Bay town council has decided to set an example by banishing bottled water at town meetings. To find out more information about the environmental impact of water bottles, visit. Wednesday, August 6th at 11am. State Senator Larcenia Bullard will hold a ceremony honoring the late John F. Cosgrove, former state representative and first Cutler Bay Mayor, renaming a portion of the turnpike extension between SW. 152 and 216 street "John F. Cosgrove Highway". The dedication takes place at the Snapper Creek Plaza, on the Florida Turnpike Extension. Read the press release for more information. August 9th, from 9am-5pm. Enjoy activities and entertainment for the whole family. Event includes face painters, clowns, stilt walkers, storytellers, rock climbing, injury prevention programs for special needs children. There will also be Pre-K registration, KidCare outreach, art exhibits, bounce houses and raffles. The event takes place at the Miami-Dade Fair Expo Center, located at 10901 Coral Way. Phone 305-375-1492 for additional information. For additional information about the Children's Trust, visit their website. On August 9th, 8am-noon, visit the South Dade Government Center for a planting demonstration for Florida yards and neighborhood gardens. To RSVP, or for more information, contact Barbara McAdams at 305-248-3311 ext. 245. From August 4th-August 15th, 9:00am to 4:30pm. The Miami Herald announced a few weeks ago that they would be laying off over 200 employees. which included Patricia (Pati) Mazzei, who often reports on local events within our town. We are happy to report that Ms. Mazzei has received a short reprieve and will continue with the paper until Labor Day. On August 2nd and 3rd, noon to 6 pm. Get information about after school programs, photography, college planning, insurance and health care during the Falls Shopping Center "Back-To-School" splash. Enjoy free outdoor activities including paddle boats, the Sabertooth slide, motorized bumper boats, bumper cars, and an ocean bounce house. See the Miami Dolphins mascot 'TD', cheerleaders and alumni player autographs opportunities. Try your skill at the quarterback toss. Take part in hands-on crafts, face painting, balloon art, a treasure hunt and stage entertainment. For more information, visit. This Friday, August 1st, at 8 pm. Join Dr. Michael Slifer, M.S. at the Miami Science Museum as he discusses genomic medicine. Find out how emerging genomic technologies are providing the means to prevent disease, but also raising fears about how genetic information might be used. Visit www.miamisci.org for more information. FEMA has announced that they will no longer provide ice to communities after a hurricane. Before a storm hits, fill your freezer with ice and 3/4 filled water bottles. Set your refrigerator and freezer to their coldest setting. On Saturday, July 26th, from 9am-noon, the Miami Dade Adopt-A-Tree program will be giving away trees at the Miami-Dade County Auditorium, located at 2901W. Flagler. Trees available on that day include Queensland Crepe Myrtle, Paradise Tree, Star Fruit, Lychee, and Jaboticaba. Participants must bring a valid picture ID. For more information or for other Adopt-A-Tree dates and locations, call 305-372-6555, 311, or visit the Adopt-A-Tree website. Deadline to register for the August 26th primary election is July 28th. Early voting will take place between August 11th and August 24th. For more information about the election, visit. Saturday, July 26th, 8pm (gates open at 7). The Deering Estate hosts the 5th Annual Summer Cabaret Series. Guests can bring refreshments and snacks to enjoy during the show. Tickets are $20, To purchase tickets or for more information, please call 305-235-1668 ext. 233, or visit www.deeringestate.org . The Deering Estate is located at 16701 SW 72 Avenue. This Saturday, July 26th and Sunday, July 27th. Visit Fairchild Gardens to learn all about butterflies. Enjoy kids activities, walking tours, educational lectures along with a one-of-a-kind plant sale. For more information, contact Ann Schmidt at 305-667-1651 ext. 3344. On Wednesday, July 23rd at 7pm. Visit the Deering Estate Visitors Center for the opening night reception of their Fine Art photography exhibit "Endangered". Along with the artwork, there will be a wine and cheese reception. All artwork will be for sale. A portion of the proceeds will be donated back to the Deering Estate. The event is open to the public and admission is free. Is Your School Making The Grade? The School Accountability Reports are now available. Below are the "grades" for the schools in Cutler Bay and surrounding areas. To find the grade for a school not listed here visit this Florida Department of Education website. Beginning Wednesday July 16 from 7-8:30pm. Learn the basics of Fox Trot, Cha-Cha and Swing dancing. This class is for ages 18 and older. Cost is $70.00 for a six-week session. These lessons take place at the Deering Estate, located at 16701 SW 72 Ave.
On Monday, July 14th, beginning at 7pm. The Town's WiFi committee will meet at Town Hall, located at 10720 Caribbean Blvd, Suite 105. Saturday, July 12th and Sunday, July 13th. Enjoy unique handmade crafts, jewelry and artwork at Southland Mall Center Court. Saturday, July 12 and Sunday July 13, from 9:30am-4:30pm. Fairchild Gardens presents their International Mango Festival featuring tree sales, lectures, a children's program with puppet show, theater, food demonstrations, and of course mangos; over 200 from Fairchild's own nurseries. For more information phone 305-667-1651 or visit . Fairchild Gardens is located at 10901 Old Cutler Road. Admission is $20 for adults, $15 for seniors, and $10 for children. The Riptides Water Polo team is holding a Car Wash Fundraiser this Sunday, July 13th from 10-2 at the Pep Boys in Cutler Bay. They are raising money to pay for their team to travel to California at the end of this month to compete in USA Water polo's Junior Olympics. Please support the kids in our community. Wednesday, July 9th at 7:00 pm. There will be a zoning workshop at Cutler Ridge Park. The focus of this workshop will be to discuss 2 proposed developments. First will be a site plan review for City Furniture's proposed store located at approximately 187 Ave and South Dixie Hwy. This is expected to be City Furniture's first LEED compliant building in the United States. Also to be discussed, Tropical Financial Credit Union's site plan review for a location at 18690 S Dixie Hwy. The zoning hearing will take place at Cutler Ridge Park, located at 10100 SW 200th St.
On Thursday, July 10, from 7-8pm. Robert Torres, field representative for the Nature Conservancy, will talk about the importance of Florida to migratory birds, various bird locations and the different species that can be found in florida. The event is free to the public and takes place at the Deering Estate Visitors Center auditorium. The Deering Estate is located at 16701 SW 72 Ave. For more information, call 305-235-1668. 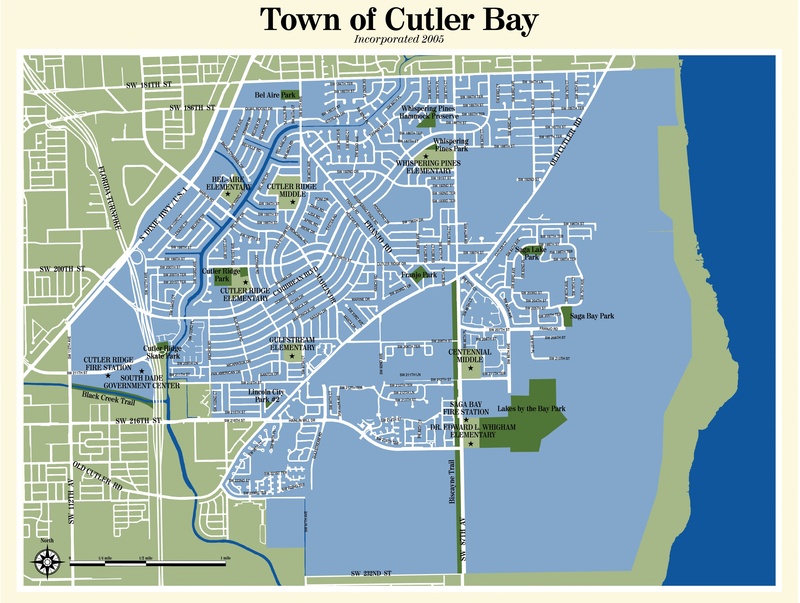 The State of Florida has awarded the Town of Cutler Bay over $1,000,000. The money was appropriated for a stormwater project, recycling initiative, and for parks. See how your representative voted on environmental issues or find out how the top candidates for president scored on their environmental policies. Visit, www.lcv.org/scorecard/. Miami-Dade's gun bounty program is now one year old. Read about the success of the program, and how you can help get guns off our streets. For a list of native plants that need less water and are best suited for our community, visit. Have questions on why you should use native plants and where you can purchase them, visit. The State of Florida has created a website of Florida's most wanted criminals, many of whom were last known to live in the Miami-Dade County area. To visit the site, click here. According to an article in the South Florida Business Journal, Cutler Bay Development Corp. has filed for Chapter 7 bankruptcy. Cutler Bay Development owns 40 plated and improved lots at and around 8951 SW 215th Lane, in Cutler Bay. Read the full article here. Hurricane season begins June 1st. For information about pruning your trees before the season begins, visit this webpage. All Cutler Bay residents, celebrate the 4th at Whispering Pines Park from 9am-1pm. The parade starts at 9am, followed by hamburgers, hot dogs, cold drinks, sno-cones, popcorn, games, raffle, and new this year, a police officer dunk tank featuring Cutler Bay's motorcycle officers. Proceeds from the dunk tank go to the Police Officer Assistance Trust (POAT). Whispering Pines Park is located at Ridgeland Drive and SW 88th Ct.(map). See the flyer for details. The next meeting of the Concerned Citizens will be Tuesday, July 1st, at 7:00p.m. in the Community Room of Cutler Ridge Park. The meeting will be a memorial for the group's late president, James Shiver. Citizens are asked to bring a dish to share. Participants who so desire, will be allowed to speak about how Jim affected their life, and the impact he had on the community. There will be no meeting in August. Details of the September 5th, 2008 meeting will be announced at a later date. For questions, contact Freddie Ambrose at (786)252-2798. Wednesday, July 2nd, from 3-4pm. Wild About Bugs. For children in grades 2-6. Wednesday, July 2nd, from 6-7pm. Chess Instruction for Beginners. For Teenagers. Thursday, July 3rd, from 6-7pm. Dance, Dance, Revolution: The Game Night for Teens. Ages 12-18. On June 28th, from noon to 5 pm. "Thinking Of You Services", a non-profit organization, will be holding a Bar-B-Que and fundraising event to send much needed items to our troops overseas. This event takes place at the US Coast Guard Station, located at 16001 SW 117 Ave. RSVP to Freddy Ambrose at 786-252-2798 or email. Requested donation items include: Coffee (8-16 oz. Bags), Energy Bars, Diaper Wipe Packets, Beef Jerky, Chapstick, and Deodorant. Read the flyer for more information. Saturday, June 28, beginning at 7 pm. Holy Rosary Catholic Church invites you to share an evening as they journey through time performing some of the country's most patriotic songs. Bring a blanket and chairs. Holy Rosary Church is located at 18455 Franjo Road. For more information call 305-235-5135. June 28th from 1-3pm. Visit Southland Mall (fountain area) for South Florida Parentings Kids Fun Event. This "Parade of Games" includes face painting, balloon art, patriotic kids crafts, games with prizes, and Fourth of July giveaways. Phone 305-235-8880 for additional details. June 28th, July 26th and August 30th at 8pm. The Deering Estate hosts the 5th Annual Summer Cabaret Series. Guests can bring refreshments and snacks to enjoy during the show. Single tickets are $20, or $55 for the three-concert series. To purchase tickets or for more information, please call 305-235-1668 ext. 233, or visit www.deeringestate.org . The Deering Estate is located at 16701 SW 72 Avenue. Just a reminder that everyone who carries a cell phone should program in an "In Case of Emergency" (ICE) phone number into their contact list. By programing one or more numbers under the code ICE, medical personnel know who to contact for life saving information. Make sure your children's cell phones are also programmed. Beginning at 7pm on Wednesday June 25th, at Cutler Ridge Park. The South Dade Children's Resource Network is having a "focus" group meeting to discuss your ideas on what services are needed in Cutler Bay for our children. Come share your thoughts on service gaps for children and learn about services already available in our community for children. The South Dade Children's Resource Network (CRN) is an innovative prevention program designed to improve the lives of children and their families by connecting a family's natural support system with other services within their communities. CRN brings together various child- and family-serving agencies in a service partnership, giving families a single point of access to appropriate, effective, coordinated services. Cutler Ridge Park is located at 10100 SW 200th St. For more information, visit their website, or contact Robin Davis at 786-712-0498 or by email. June 21st and 22nd from 10am-5pm. Visit the Redland Fruit and Spice Park for this annual event showcasing local agriculture, tropical fruits, local wines, foods and rare fruit samplings. The Park is located at 24801 SW 187 Ave. Admission is $6 for adults, free for children under 12. Phone 305-247-5727 for additional information. On Saturday, June 21st, from 1-3pm, Commissioner Katy Sorenson will join Cutler Bay and Palmetto Bay in hosting a free hurricane preparedness workshop. The event will feature preparedness information, safety tips and giveaways. Special guest speaker is Max Mayfield, former Director of the National Hurricane Center. Representatives from FP&L, the South Florida Water Management District, and a representative of the State Attorney's Office will also be in attendance. Refreshments will be provided. The event takes place at the Deering Estate Visitors Center, located at 16701 SW 72 Avenue. For more information, contact Commissioner Sorenson's office at 305-378-6677 or read the flyer. On June 8th, 14th, and 15th at 4:30 pm. Pinecrest Repertory Theatre Company presents "A Doubleshot of Dark Comedy in Broad Daylight", with two one-act dark comedies. The production takes place at the Banyan Bowl at Pinecrest Gardens, located at 11000 Red Road, in Pinecrest. Tickets are $10 for adults and $8 for students, military with ID, and seniors 65 and older. Phone 305-720-0811 for more information or visit www.pinecrestrep.org. Monday, June 16th at 11 am. Origami Magic and Tales from Japan. For children of all ages. Wednesday, June 18th from 3-4pm. Wild About Bugs. For children in grades 2-6. Thursday, June 19th from 3-4pm. Wild About Crafts. For children ages 6 and up. Thursday, June 19th from 6-7pm. Dance, Dance, Revolution: The Game night for Teens. Ages 12-18. Wednesday, June 11th at 7:00 pm, there will be a zoning workshop to discuss Costa Brava Estates site plans for twenty single family homes located at 19691 SW 84 Ct. The workshop will take place at Cutler Ridge Park, located at 10100 SW 200 St.
June 14th from 10am–1pm. Visit the Redland Fruit and Spice Park and find out everything you ever wanted to know about mangoes. Learn how to grow them, and what insects and diseases can cause problems. Learn about the many varieties, get recipes, and sample the fruit. Cost is $50.00 per person. The Redland Fruit and Spice Park is located at 24801 SW 187th Ave. Phone 305-247-5727 for additional information. On Friday, June 6th, starting at 9pm. Visit Miami Science Museum for their Astronomy Night Laser Fest. The night begins with the music of Green Day at 9 pm, The Doors at 10pm, Led Zeppelin at 11pm and Pink Floyd at midnight. Admission, which includes laser glasses, is $7 for adults and $4 for children. The Science Museum is located at 3280 S. Miami Ave. Call 305-646-4200 or visit their website for more information. Thursday, June 5th from 6-7 pm. - Dance, Dance, Revolution: The Game night for Teens. Ages 12-18. Wednesday, June 18th from 3-4 pm. Wild About Bugs. For children in grades 2-6. Monday, June 16th at 11 am � Origami Magic and Tales from Japan. For children of all ages. Thursday, June 19th from 3-4 pm. Wild About Crafts. For children ages 6 and up. Saturday, June 7th from 1-4pm at the South Dade Regional Library. Share your ideas for the development of a new bicycle and pedestrian plan for Miami-Dade County. For more information contact Heather Leslie at 305-254-8598. June 7th, from 10am-5pm at the Redland Fruit and Spice Park. Learn the methods utilized in producing tropical fruit trees. Learn how to plant, seed, air layer and graft. This all day session includes a lunch break. Participants will receive a tree to graft and take home. Cost is $40. Saturday, June 7th from 8am-noon. Help clean up and preserve the beauty of the Pine Rockland located next to Pinewood Villas in Cutler Bay. For additional information, email. Registration for the Riptides summer recreational swim program has begun. The program runs from June 9th-July 24th at Cutler Ridge Pool. Cost is $85 for the first child, with discounts for siblings. This includes practice Monday through Thursday and Saturday swim meets. Tryouts are Saturday May 31st from 3:30-6:30pm or during regular practice from 5-6:30pm. For registration forms and additional information, visit www.riptideswaterpolo.com or call 305-253-9194. Third grade FCAT scores for reading and math have just been released. Test scores range from 1 to 5 with "3" considered to be at grade level. Shown below are the percentage of students in each school scoring at a level "3" or higher. Scores for Cutler Bay schools are shown below along with a sampling of scores from neighboring communities. Thalatta Park in Palmetto Bay is now open to the public on weekends from 10am to 4pm. The 4 acre park, located at 17301 Old Cutler Road, has a unobstructed view of Biscayne bay, and is home to numerous native birds and plants. At 7pm, Tuesday, June 3rd, at Cutler Ridge Park. This month's speaker will be Cutler Bay Seat 1 Council Member Tim Meerbott. The meeting will take place at Cutler Ridge Park, located at 10100 SW 200 St. This Thursday, June 5th, from 7pm-8pm. Visit the Deering Estate Auditorium for a free lecture by Lt. Scott Mullin of the Miami-Dade County Fire Rescue. The discussion will focus on venomous snakes and the "Venom I" snakebite response unit. Saturday, May 31st, and Sunday, June 1st, 2008. This show takes place at Fairchild Tropical Gardens, located at 10901 Old Cutler Road. For more information, visit the Fairchild Tropical Garden website. On Friday, May 23rd,through Sunday, May 25, 2008, at the Garden House at Fairchild Tropical Botanic Garden. Presented by the South Florida Cactus & Succulent Society. May 24 and 25, from 10am-4pm. Visit the Miami Seaquarium for "WHALE Tales" (water habits are learned early) a water safety themed educational program for children. Visit www.miamiredcross.org for a coupon for a free child's admission ticket with a $15 paid adult admission. The Miami Sequarium is located at 4400 Rickenbacker Causeway. May 24th from 10am - noon. Ride along the trails exploring the scenic landscape of the Deering Estate. Meet 15 minutes prior to ride. Cost is $15.00, $10.00 if you ride your own bike. Cost includes park admission. For ages 9 and older. Smallest bike available is 16 1/2 inches for guest 60" or taller. Phone 305-235-1668 ext. 233 for additional information. Tuesday, May 27th, from 6-8pm at the South Dade Regional Library. Now is the time to register for a chance to enroll your child in the state's free Voluntary Pre-Kindergarden (VKP) program. For information visit www.VPKhelp.org or phone the Child Development Services office at 305-372-3521. Cutler Bay parents may register their eligible children and obtain certificates of eligibility by visiting the office at the South Dade Government Center, 10710 SW 211 St. Phone 305-258-5471. The hours of operation are 8am to 5pm, Mondays, Tuesdays, Thursdays and Fridays, and 8am to 6pm on Wednesdays. Children must be 4 years old by September 1st to register. According to this article on furnituretoday.com, City Furniture is planning to build in Cutler Bay what is believed to be the country's first LEED-certified showroom. The company has purchased land to build the 57,000 square foot building next to the current City Furniture Store in Cutler Bay. The plans, which are in the early stages, call for the existing store to be converted into an Ashley Furniture HomeStore. This information was confirmed on April 21st, at the Cutler Bay Green Conference, by Cutler Bay Mayor Paul Vrooman and City Furniture President Keith Koenig. LEED promotes a whole-building approach to sustainability by recognizing performance in five human and environmental health areas. They include sustainable site development, water savings, energy efficiency, materials selection and indoor environmental quality. Wednesday, May 21 from 10am to 7pm. Commissioner Katy Sorenson will host a "Free Alternatives to Foreclosure" workshop at the Kendall Branch Library, located at 9101 SW 97 Ave. The workshop will be presented in both English and Spanish. Homeowners are asked to bring their mortgage documents and family budget in order to receive financial counseling. For more information, read the press release, or contact Comissioner Sorenson's office at 305-378-6677. Wednesday, May 21st, from 3:30-4:30pm at the South Dade Regional Library. Suitable for children of all ages. May 16th, 17th and 18th, from 9am-5pm. Visit the Redland Fruit and Spice Park for the largest annual orchid show in the country, featuring over 50 booths of educational exhibits and vendors. There will be lectures by experts, raffles, and international food. Admission is $5. The park is located at 24801 SW 187th Ave., in Homestead. Phone 305-247-5727 for additional information. Saturday, May 17th from 10am till noon. Help the environment and save money on your water bills by using a rain barrel. The cost is $45 for the rain barrel and workshop. Additional barrels are $40 each. Workshop registration is $10 without barrel. You must register by May 9th to participate. Phone 305-248-3311 ext. 242 for additional information. The Estate is located at 16701 SW 72nd Ave. For more information visit, http://miami-dade.ifas.ufl.edu/environment/documents/RB_May08_001.pdf. Saturday, May 17th and Sunday, May 18th, from 9:30am to 4:30pm, at Fairchild Tropical Botanic Garden, 10901 Old Cutler Rd.,in Coral Gables; $20 adults, $15 seniors, $10 children 6-17, free for members and kids 5 and younger. Call 305-667-1651 or visit fairchildgarden.org. On Thursday, May 15, 2008 10:30am, at the South Dade Regional Library. Enjoy the sounds of the Singing Miamians, a local barbershop harmony group. This Saturday, May 10th-Sunday, May 11th at Fairchild Tropical Botanic Garden. Fairchild Garden is located at 10901 Old Cutler Road , Phone 305-667-1651 for details. May 11, 10:30am-3pm. Celebrate Mother's Day at Fairchild Garden with brunch at the Garden House. Adults, $49; children, $24.50; 4 and younger, free. This does not include admission to Fairchild. To make reservations or get more information, visit. Fairchild Garden is located at 10901 Old Cutler Road, in Coral Gables. Sunday, May 11th at the Miami Seaquarium. This special day will allow families to wade into the pool for a face-to-face encounter with a dolphin. Families can choose a 9:30am, 10:15am, 11:30am or 12:15pm session. Each session is followed by a champagne buffet brunch overlooking the dolphins at Dolphin Harbor. Adults, $159; children, $199. Brunch only: adults, $70; children, $65. The Seaquarium is located at 4400 Rickenbacker Causeway. For more information, visit, or phone 305-365-2501. May 11, 11am-4pm. Bring Mon to Gold Coast Railroad Museum where she will receive free admission and Link Train ride with the purchase of an admission and Link Train ride. The museum is located at 12450 SW 152nd St. Call 305-253-0063 for details. Wednesday, May 7th, 3:30-4:30pm. Kids 4 and up will enjoy making crafts for Mom. Saturday, May 10th at Southland Mall. Browse through works of art produced by the students of RR Morton Elementary School during their 23rd annual Magnet Art Exhibition. The exhibition takes place during regular mall hours. While you are there, celebrate Mother's Day with crafts, face painting, hair art, tattoos and a wheel of prizes. The craft activities take place between 1 and 3 pm, at the mall's Center Court. The Town of Cutler Bay and the Miami-Dade Police Department invite you to a 2008 Hurricane Awareness Event being held at Southland Mall, on March 10th, from 10am-2pm. For additional information, call 305-234-4237. On Saturday, May 10, from 9am - noon. Miami Dade Adopt-A-Tree program begins again with their first event on at the Miami-Dade County Fairgrounds located at 11200 SW 24th Street. Trees available on that day include Vera Wood, Pigeon Plum, Longan, and Tamarind. Participants must bring a valid picture ID. For more information or for other Adopt-A-Tree dates and locations, call 305-372-6555, 311, or visit the Adopt-A-Tree website. May 10th, at the Miami Science Museum. Join Jack Horkheimer for a fun filled day and Night packed with everything Astro. Star shows, speakers, workshops, laser shows and more. Enter for a chance to win a Meade Telescope. Costs vary. The Museum is located at 3280 South Miami Ave. Phone 305-646-4200 or visit www.miamisci.org/www/astronomy-day.phpfor details. On May 10th from 7:30am-10:30am at The Deering Estate, located at 16701 SW 72nd Ave. Join a Deering Education and Interpretive Staff Member in search of some of the Deering Estate's estimated 170 perennial and migratory bird species. Price is free with paid admission to the estate. Phone 305-235-1668 ext 233 for details. At 7pm, Tuesday, May 6th, at Cutler Ridge Park. This month's speakers are Captain Julie Miller of the Cutler Bay Police Unit, Council Member Peggy Bell discussing parks, and discussion about the housing market and reverse mortgages with a representative of HUD. The meeting takes place at Cutler Ridge Park, located at 10100 SW 200 St.
From 6pm, May 3rd until noon on May 4th. Join the residents of Cutler Bay and Palmetto Bay as they join to raise money for cancer research. The relay will take place at Miami Childrens Hospital, South Dade Center located at 17615 SW 97th Ave (near the intersection of US-1 and Franjo Rd). For more information, visit. On May 3rd, from 10am-5pm, visit the Fruit and Spice Park for their new event highlighting the practical methods used to improve health and well being. Services include Aromatherapy, Reiki, Chair Massages and Meditation. There will be Tai Chi, Yoga classes and health food demonstrations. Admission is $6. The park is located at 24801 SW 187th Ave., in Homestead. Phone 305-247-5727 for additional information. Saturday, May 3, from 11am-4pm. Visit the Gold Coast Railroad Museum and enjoy free admission to the museum, open exhibits, bounce houses, model trains, coloring activities and videos for the kids, and railroad spike driving demonstrations. Train rides for an additional fee. Phone 305-253-0063 for additional information. The Museum is located at 12450 S.W. 152nd Street. Saturday April 26th, from 1pm-5pm, the Cutler Ridge Elementary PTA will be holding their Annual Spring Fling at Cutler Ridge Park. There will be food, fun, and games including a live band, bounce houses, a train ride, and more. Refreshments will include: hamburgers and hot dogs, corn on the cob, baked goods, chips, and drinks. Tickets for the bounce houses, train ride, and games are $.50 each, or get a $9 armband for unlimited play. On Saturday, April 26th from 9:30am until 4:30pm. Visit Fairchild Tropical Botanic Garden for their Spring Plant Sale. These native plants are perfect for South Florida landscapes. A variety of plants are available for sale including rare, unusual or one- of-a-kind plants. Be sure and arrive early for the best selection. In addition, enjoy the artistry of Botero, Chihuly and Lichtenstein with your admission. The Garden is located at 10901 Old Cutler Road. Admission to Fairchild for adults is $20, seniors 65 or older $15, and children 6-17, $10.00; Admission is free for children 5 and under and for members. Members may enter at 9 am. For additional information visit. To find native plants appropriate for your zip code, visit www.regionalconservation.org. April 26th from 10am to 7pm. Visit Cauley Square for a day fun filled day of activities including music and food, family bazaar sale, exotic reptile show, petting zoo, and belly dancing. Visit www.cauleysquare.com for details or phone 305-258-3543. Help turn an overgrown lot into a natural park area. The Town of Cutler Bay, Bay Community Church, and ValleyCrest Landscape Maintenance are sponsoring a cleanup of Lincoln City Park 2 on Sunday, April 27th, beginning at 9am. Lincoln City Park 2 is located at SW 215th St and SW 99th Ave (map). For more information or to sign up as a volunteer, contact the Parks and Recreation Department at 305-238-4166. April 21st-25th, 10am daily. Celebrate National Park Week with special prices on ranger-guided boat trips to the coral reef or northern keys. The trips, lasting 3 hours, depart from Dante Fascell Visitor Center, located at 9700 SW 328 Street. Cost is $16.45. For more information call, 305-230-1100. Space is limited so call early. Cutler Bay will be holding a conference to promote Earth Day and raise awareness of "green" products. The conference will be held on Monday, April 21st from 5:30-8:00pm, on the 2nd floor of the South Dade Regional Library, located at 10750 SW 211th St. Read the flyer for more information. On April 24th, beginning at 9:30am, the Miami-Dade County Commission is expected to take a final vote regarding moving the Urban Development Boundary. The vote takes place at the Stephen Clark Government Center located at 111 NW 1st Street in downtown Miami. We urge everyone available to attend this meeting and support holding the line. For information on how you can help, or to watch a video about the Hold-The-Line campaign visit, www.udbline.com/index.htm. Saturday, April 19th, launches at 6:30am and 5:30pm. Sunday, April 20th launch at 6:30am. More than 40 hot air balloons are expected to participate in the 25th Sunrise Balloon Race and Festival. The event takes place at Kendall-Tamiami Airport located at 12800 SW 137th Ave. A huge outdoor pancake breakfast is served both days. The event benefits South Florida Citizens with Disabilities. For more information and a schedule of events call 305-596-9040 or visit, www.sunriseballoonrace.org. Traffic was an issue at last years event so be sure and arrive early. On Saturday, April 19th, join the American Lung Association and Miami Metrozoo for their 3rd annual 5K walk. The event includes fun activities for the kids including a bounce house, face painting and balloons. There will be free food for participants as well as health screenings. For more information and on-site registration, visit www.greatermiamicontinentals.com, or phone 305-233-4594. April 19th and 20th from 10am to 5pm. Visit the Fruit and Spice Park where they will have on display a large exhibit of Heliconia blossoms and plants for sale. Palm trees, shrubs and orchids will also be available. The park is located at 24801 SW 187th Ave, in Homestead. Phone 305-247-5727 for more information. April 20 starting at 1pm. Celebrate Earth Day at the 2008 Green Apple Festival in Miami. This first time event features environmental leaders and community activists, all demanding immediate action against global warming. Entertainment includes Menudo, Arrested Development, Baby Loves Salsa, and Caravan of Thieves. For more information, visit. Sunday, April 20th, 10am to sundown. Visit Crandon Park Lot 2 on Key Biscayne for an Earth Day celebration of the Earth, the Everglades and the promise of a sustainable South Florida. Enjoy music and spoken-word performances, sustainable foods, green exhibits and vendors, hand-on workshop and nature-based activities. Come early for pre-event activities such as Eco-fitness on the beach (7am), Bird Walk (8am) and Kayak Tours for $10 (9am, admission is free but parking is $5). Bring a blanket or chair, Your own water bottle (free refills), drum or instrument for drum circle and any electronic or computer equipment to recycle. Call 305 361-6767 or visit for more information. There will be a Council Workshop at 11:30am on Thursday, April 17th, at Cutler Bay Town Hall, located at 10720 Caribbean Blvd., Suite 105. The public is invited. There will be a Council Workshop at 11am on Friday, April 18th, at Cutler Bay Town Hall, located at 10720 Caribbean Blvd., Suite 105. The public is invited. April 14th thru the 18th, visit Jungle Island and find out how you can help protect the environment. The Fantasy Theatre Factory will present their original environmental conservation comedy, "The Never Everglades". Seating is limited so you must have reservations to attend the daily shows. For further information visit, www.parrotjungle.com or call 305-400-7221. Palmer Trinity in Palmetto Bay is requesting permission to expand their school and build a large sports complex on 33 acres of land bordering Cutler Bay. This expansion will increase traffic throughout the area and INCLUDES AN ENTRANCE ON EUREKA DRIVE (SW 184th St). The second zoning hearing is scheduled for Monday, April 14th at 6pm at Southwood Middle School, located at 16301 SW 80th Ave. For more information, visit. Go to our forum to discuss this issue. On Saturday, April 12th, 10am-4pm and Sunday, April 13th from 10am-1pm, the Deering Estate will host a two-day painting and photography event. Artists will be painting on the grounds of the estate. Judging of the artwork and photography will take place from 1:30pm to 2:30pm on Sunday. The event is free with the cost of admission to the estate. For more information visit, www.deeringestate.com. This Sunday, April 13, beginning at 7:30am. Join members of the Tropical Audubon Society as they tour Cutler Bay birding locations. The tour begins at Bill Sadowski Park and will make stops which may include Black Point, Dump Marsh and the Cutler Wetlands. Bring a lunch. Walkie-talkies are recommended. The tour is free and open to the public. For more information, visit www.tropicalaudubon.org or contact Brian Raposa at 305-388-1544 or by email. The South Florida Water Management District has implemented one-day-a-week residential landscape irrigation for South Florida. Odd numbered addresses are allowed to water on Monday from 4am-8am OR 4pm-8pm, even numbered addresses on Thursdays from 4am-8am OR 4pm-8pm. Hand watering is limited to 10 minutes a day. No restrictions apply to car / boat washing, pressure cleaning, or other similar water uses. For more information, visit this SFWMD website. Tell your friends and neighbors!!! You can help Cutler Bay win $25,000 for Cutler Ridge Park and a celebration with Dwyane Wade. Just visit www.staplesdreampark.com, register and vote for Cutler Ridge Park. For 10 extra votes, get a Power Card from the new Staples store that just opened at the South Dade Plaza Shopping Center (at US1 and 184th Street). The contest ends on April 10. Please remember to vote daily. On Saturday, April 19th from 9am until noon, join thousands of volunteers for the largest shoreline cleanup in Miami-Dade County. Last years participants collected over 33 tons of garbage and made a tremendous effect on our environment. The two cleanup sites near Cutler Bay are Blackpoint Marina and the Deering Estate. You must register before April 4th to participate. You can register on-line at www.miamidade.gov/derm. For more information, read the flyer, or call 305-372-6784. Coral Way and 112th Avenue, Southwest Miami. The Fair brings 18 days of fun-filled, family entertainment, including rides, entertainment, food, exhibits, a daily Mardi Gras parade with a different celebrity, Grand Marshal each night, floats, samba dancers and drums. Admission is $9. Visit www.fairexpo.com or call 305-223-7060 for more information. Cutler Bay will be holding their first code compliance hearing on Tuesday, April 8th at 10am at Cutler Bay Town Hall, located at 10720 Caribbean Blvd., Suite 105. The public is invited. FP&L will be holding a community meeting at 7pm on Monday, April 7th at Whigham Elementary School, located at 21545 SW 87th Ave. Representatives from FP&L will discuss their plans to build 2 new nuclear reactors at Turkey Point. This weekend, April 5th and 6th, from 10am-5pm. Find great ideas for transforming your backyard into a tropical paradise. This event features exhibits, workshops and lectures, food and shopping. Pinecrest Gardens is located at 11000 Red Road. Cost is $5.00, Kids 12 and under free. For more information call 305-669-6942 or visit www.pinecrestgardens.com. On Saturday, April 5th, and Sunday, April 6th, come to Fairchild and enjoy the best palm and cycad collection, show and sale in South Florida. Fairchild Tropical Botanical Garden is located at 10901 Old Cutler Road, in Coral Gables. For additional information, phone 305-667-1651 or visit www.fairchildgarden.org. On Friday, April 4th at 8pm, visit the Miami Science Museum for a talk by Dr. Benjamin Santer on the "Effects of Human Activity on Global Climate Change: What Do We Know, and How Do We Know It?" Dr. Benjamin Santer is an atmospheric scientist at Lawrence Livermore National Laboratory and shares the 2007 Nobel Peace Prize (along with Al Gore and others). The lecture is free. The Museum is located at 3280 South Miami Ave. Phone 305-646-4200 for additional information, or visit. The next meeting of the Concerned Citizens will be Tuesday, April 1st, 7 pm, at Cutler Ridge Park. Council Member Peggy Bell will be at this month's guest speaker to answer your questions regarding parks in our community. Sunday, March 30th from 11am to 6pm. Savor delectable seafood and enjoy the music at the Deering Estate's 4th Annual Deering Seafood Festival on the Bay. This event features food, music, scenic boat rides, cooking demonstrations, and a kids Zone. Cost is $15.00 for Adults; $5.00 for Children ages 4-12. The event takes place at the Deering Estate, located at 16701 SW 72nd Ave. For more information, call 305-235-1668 ext. 263, or visit. On March 30th, ride your motorcycle, car or truck to benefit Miami Metrozoo. This event, dedicated to the memory of Amy Neill, former Senior Zookeeper, is to help raise money raise money to pay for special equipment to conduct medical evaluations for the giraffes. Cost is a $20.00 donation per vehicle (up to 2 riders). The ride begins at Amos Sports Grille, 7800 SW 104th Street, Miami, Fl, and ends at Metrozoo. Registered participants will receive one free commemorative tee-shirt per vehicle and free admission for 2 to the zoo on the day of the ride. Snacks and coffee will be provided during registration which is from 8:45 until 10 am. Additional friends who enter with registered participant may visit the zoo for $4.00. Participants will enjoy special animal encounters, motorcycle displays , and a wildlife show (noon), and Giraffe zookeepers talk (2pm). For pre-registration information or additional questions, please contact the event organizers Dr. Suzanne Banas at 305-905-1860 or John Birk at 305-323-3855, or visit the website. On March 29th from 8pm to 9pm, join millions of people across the world as they turn off their lights for one hour to deliver a statement about climate change and about protecting our Earth. For details, visit www.earthhour.org. Saturday, March 29nd from 9am-noon. Take the kids to the Deering Estate for their "Rocks & Soil: Geology" Kid's Camp. Children will be introduced to the different types of rocks and soil formations. Cost is $30 per child ages 6-10 with a $10 one-time annual camp registration. The Deering Estate is located at 16701 SW 72nd Ave. Phone 305-235-1668 ext. 233 for more information. On March 28th, from 8am-11am. Help restore the unique plant community of this Cutler Bay Rock Pineland Preserve. Participants are required to complete a release form and volunteers, volunteers under 18 must have the form signed by a parent of legal guardian. The Preserve is located at SW188th St and 87th Ave in Cutler Bay. For more information, visit www.miamidade.gov/parks/library/VWCalendar2007-2008.pdf, or call 305-257-0933 ext 227. Saturday and Sunday, March 22 and 23 from 11am-4pm. Join the fun at Metrozoo during their Great Egg Safari. There will be continuous egg hunts for kids 12 and under, as well as scheduled egg hunts for the animals. Enjoy music, face painting, crafts, games, rock climbing, a bounce house and photos with the Easterus Bunnylia. The cost of admission is 13.95 for adults, 9.95 for children. The Zoo is located at 12400 SW 152nd Street. For more information, phone 305-251-0400. Sunday, March 23rd from 10 am � 4 pm. Hunts take place at 1 pm (ages 1-5), and at 3pm (ages 6-12). This event includes Pony Rides, face painting and arts and craft classes. Free admission. Cauley Square is located at 22400 S. Dixie Hwy. Phone 305-258-3543 or visit www.cauleysquare.com for details. This Sunday, March 23rd from 8am to 11am. Experience the beauty of Biscayne Bay as you make your way to Chicken Key Island by canoe. Cost is $25 for Adults, $15 for children ages 9-14. The event takes place at the Deering Estate located at 16701 SW 72nd Ave. Phone 305-235-1668 for additional information. Visit Southland Mall on Friday March 21st and Saturday March 22nd for a variety of unique crafts. Saturday, March 22nd from 9am-noon. Take the kids to the Deering Estate for their "Mosses are Picky Creatures" kid's camp. Children will explore the dark and wet sections of the Estate's natural areas, see a presentation introducing them to mosses and observing them under the microscope. Cost is $30 per child ages 6-10 with a $10. one-time annual camp registration. The Deering Estate is located at 16701 SW 72nd Ave. Phone 305-235-1668 ext. 233 for more information. Saturday, March 22nd starting at 10 am. Children ages 9 and under are invited to participate in a Easter Egg Hunt at Cutler Ridge Park, located at 10100 SW 200 Street. For more information call 305-238-4166. On Saturday, March 22, Cutler Ridge United Methodist Church will be holding their third annual Easter Egg Hunt beginning at 10 am. After the hunt, events includes games, relays, refreshments and more. This event is free and all preschool and elementary age kids are invited. The Church is located at 20740 Old Cutler Road. Please call Yvonne Wright at 305-235-2764 for more information. Saturday, March 22nd, 1 pm until 4pm. Easter eggs, story telling, face painting, games, music, arts, crafts, prizes, and refreshments on the grounds at Saint Faith's Episcopal Church. The church is located at 10600 Caribbean Blvd. Phone: (305) 235-3621 for additional information. Pinecrest Gardens Fifth Annual "Hop Through The Garden"
Visit Pinecrest Gardens on March 22nd 10am-1pm for a fun-filled day of egg hunts, along with bounce houses, face painting, tattoos, arts and crafts, along with the Spring Bunny and Alice in Wonderland characters. Find the golden egg and win a prize. Three hunts scheduled at 10 am, 11am, and noon. General admission is $5.00. Please bring your own basket. Pinecrest Gardens is located at 11000 Red Road, in Pinecrest. For more information phone 305-669-6942. See the flyer for more information. March 21st-23rd, from 10am-4pm. The Miami Seaquarium invites you to join them for their annual Easter Egg Hunt. There will be three days of continous easter egg hunts. Win candies, chocolates and special prises. Also enjoy arcade games, music, face painting, giant slide, bounce houses and more. Save $6.00 with a coupon or receipt from a participating Publix. For additional information, visit www.miamiseaquarium.com or call 305-361-5705. Saturday, March 22nd and Sunday, March 23rd. Visit Miami's Science Museum for two full days of fun, games and prizes for the whole family. Two hunts daily. Visit the website or call 305-646-4405 for more information. This Friday, March 14th from 7 to 10 pm. Bring the kids and join the fun at the Palmetto Mini Golf Course Grand Opening. There will be music, a putt challenge for your chance to win $5,600, and free mini golf for everyone. The course is located at 9300 SW 152nd Street. For more information see the flier. Cutler Bay's Spring 10.6 mile Bike Ride will be held on Saturday, March 15th. The ride begins at the Southland Mall Parking area closest to Caribbean Blvd. Registration starts at 8:30, a safety workshop will be held at 9:00 and the ride begins at 9:30am. Two rest stations will be set up with refreshments. Helmets are required. On Saturday, March 15th, from noon until sunset. Spend the day enjoying a taste of Irish culture. Enjoy Irish music, Irish crafts and of course great Irish food. Lot's of fun for the kids including clowns, face painting, a giant slide, rock climbing and more. For additional information visit, www.emeraldsocietysfl.com/TheFestival.html. Sunday, March 16, 12:30pm-6pm. Join the fun and the crowds as Miami celebrates the biggest block party of them all. 23 blocks of international food, drinks, and 30 stages of live entertainment, including a kidzZone. The event is held along SW8th Street, east of 32nd Ave. in Little Havanna. The event is free. For additional information visit www.carnavalmiami.com or phone 305-644-8888. March 16th 2-4 pm (Arrive 1:30), Take a ride on a pontoon boat. $35 per person. Space is limited. March 19th 7-11 pm., Enjoy a moonlight Canoe Tour to Chicken Key. Cost is $35. (adults 18 and over). Saturdays and Sundays, 10am-3pm, Kayak Rentals, Adults $10 per hour, Children (9-15)$8 per hour. Must be 21 year old to rent a kayak. People between the ages of 9 and 20 must be accompanied by an adult. The Deering Estate is located at 16701 SW 72nd Ave. Phone 305-235-1668 ext. 233 for additional information. A new miniature golf course has opened on SW 152nd Street just off US1 at the entrance to the Palmetto Gulf course. The course is open Monday through Friday until 10pm and on Saturday and Sunday until 11pm. Cost is $5 on weekdays before 6pm, and is $6 after 6pm and on weekends. For additional information, call 305-235-1069. On Saturdays, beginning March 8 to June 7th from 9am-noon. The Center for Autism and Related Disabilities (CARD) will be sponsoring a baseball program for children with disabilities. The program is open for children ages 9-12 only. Space is limited. Children will receive a baseball uniform and trophy. T-Ball will be set up for those who need it. Email Lynette Estrada or call her at 305-978-1473. The program takes place at D. Redd Park located at 550 N. Homestead Blvd., in Homestead. From January 25th through May 11th, visit Miami Metrozoo for the opening of the largest traveling reptile exhibit in the world. Hours are from 9:30am to 5:30pm., ticket booths close at 4 pm. Admission is $13.95 for adults, $9.95 per child 3-12 (plus tax). For more information, call 305-255-5551 or visit www.miamimetrozoo.com. The next Cutler Bay charter committee review meeting will be held at 7pm on Thursday, March 13th, at Cutler Bay Town Hall, located at 10720 Caribbean Blvd (South Dade 2 Building), Suite 105. For information about early voting times, and a list of polling locations (with maps), visit our elections page. On March 8th and 9th, visit Yesteryear Village at the South Florida Fairgrounds for a celebration of spring, Easter and St. Patrick's Day. Visit the historic buildings, duck pond, gardens and museums while volunteers dressed in period costumes provide tours. Children can go on a hunt for a Pot of Gold, make sand cards, explore the Lucky Leprechaun Maze and kiss the Blarney stone. There will be pony rides, paddle boats, rock wall, Mr. McGregor's Garden, and the Easter Bunny. Prizes will be awarded for children dressed as pirates, fairies or wearing green, and for the Easter Bonnet Contest held each day at 1:30. Cost is $8.00 for both children and adults and includes all rides, games, face painting, crafts and activities. Parking is free. For more information contact Sandy Betlach at 954-747-3056 or by email. At Cauley Square from 10am-4pm. Featuring European and exotic models. Fun for the whole family including music, food and much more. Parking and admission are FREE. For more information, contact Gerry at (786)344-4228. The Palmetto Bay / Cutler Bay Chapter of the American Cancer Society's Relay For Life, will have a kickoff party on Thursday, March 6th, from 7-9pm at Rumors Restaurant, located at 20535 Old Cutler Rd. Read the flyer for more information. The Town of Cutler Bay adopted an ordinance that allows low-income senior citizens over the age of 65 an additional $25,000 property tax exemption. All applications must be filed by March 3rd. For more information, visit. On Friday, February 29 - Sunday, March 2, from 9:30am-4:30pm. More than 8 acres of orchid vendors, walking tours of Fairchild collections, great food and entertainment. Also, an American Orchid Society juried show, educational lectures and how-to demonstrations presented by the Orchid Society of Coral Gables. For more information please contact Ann Schmidt at 305-667-1651, ext. 3344 or aschmidt@fairchildgarden.org. Fairchild Gardens is located at 10901 Old Cutler Road. A "Candidates Debate" is scheduled for Thursday February 28th, 7pm, at Whispering Pines Elementary School. All 4 candidates for both Vice Mayor and Council Seat 2 positions have been invited. Bring your questions. Palmer Trinity in Palmetto Bay is requesting permission to expand their school and build a large sports complex on 33 acres of land bordering Cutler Bay. This expansion will increase traffic throughout the area and INCLUDES AN ENTRANCE ON EUREKA DRIVE (SW 184th St). A zoning hearing is scheduled for February 25th at 6:30pm at Southwood Middle School, located at 16301 SW 80th Ave. For more information, read the flyer being distributed by the Concerned Citizens of Old Culter, Inc (CCOCI). Go to our forum to discuss this issue. This Saturday, February 23rd from 11am to 3pm at Cutler Ridge Park. Join your friends and neighbors to celebrate Cutler Bay's 2nd anniversary. Enjoy free food, entertainment, rides, games, face painting and a petting zoo. Come prepared to participate in the Cutler Bay food fight! For more information, call 305-238-4166. Saturday, February 23rd from 10am-2pm. Members of the community are invited to the food court at Southland Mall for information about joining the Miami-Dade police force. On February 23rd, from 8am-2pm (no early-birds), Palmetto Bay's Sixth Annual Juvenile Diabetes Research Foundation (JDRF) Garage Sale will be held at 8895 SW 152nd Street. All proceeds from this event are donated to the South Florida Chapter of JDRF. On February 23rd and 24th, 10am-5pm. Visit Jungle Island for two days of interactive, fun-filled and educational activity geared to teaching parents and children the importance of eating healthy and staying active. Costs are $28 for adults and $23 for children (per day). Guests include Rachael Ray. Jungle Island is located at 1111 Parrot Jungle Trail, Miami. For more information, visit www.funandfitasafamily.com. A small Claims Court clinic, will be held on Thursday, February 21st. at 6:30pm at the South Dade Regional Library. This clinic, conducted by county attorneys, is free. For more information call 305-375-3677. This Wednesday, February 20, visit Bill Sadowski Park where the Southern Cross Astronomical Society will host a free lunar eclipse event. The eclipse begins at 8:43pm with the darkest point being between 10 and 10:52pm. ; and ending at 12:10 am (2/21). Bring chairs snacks, binoculars and bug spray. The park is located at SW 176th St. and 79th Ave. in Palmetto Bay. Call 305-661-1375 for additional information. On Tuesday, February 19, the Charter Review Task Force will present their final recommendations for changes to the County Charter. The Charter Review Task Force�s final report is available online. For additional information about the meeting, call 305-378-6677 or 305-375-5218. Cutler Bay Town Council elections will be held on March 11th, 2008 for the positions of Vice Mayor and Council Seat 2. Incumbent Vice Mayor Ed MacDougall will be challenged by Ed Wolmers. Incumbent Seat 2 Council member Ernie Sochin will face Kevin Woitke in the upcoming elections. Elections for Vice Mayor and Town Council Seat 2 are March 11th. These are both town-wide elections and all registered voters in Cutler Bay are eligible to vote. If you need an absentee ballot, visit http://www.miamidade.gov/elections/voting_absentee.asp. Starting December 8th through May 31st, Fairchild Tropical Garden presents a sculpture exhibition of Pop artist Roy Lichtenstein. The exhibition is open daily from 9:30am-4:30pm. Daytime admission is $20.00 for adults, $15 for seniors over 65, and $10. for children 6-17. On Thursday evenings, the Garden will be open from 6pm until 9pm; the sculptures of Lichenstein and Dale Chihuly will be illuminated with special lighting effects. Fairchild Garden is located at 10901 Old Cutler Road. For more information, visit the Fairchild Garden website. On February 16th, 17th and 18th from 9am-6pm. Enjoy one of the nation's premier outdoor Fine Arts Festival. Visitors enjoy beautiful art work, fine cuisine and live entertainment. Kids can create their own works of art at the kids creative corner. The fair takes place in Coconut Grove along the streets of McFarlane Road, South Bayshore Dr. and Pan American Drive. Round-trip shuttle service runs every 15 minutes from the Douglas Road Metrorail station. For more information, visit www.coconutgroveartsfest.com. Sunday, February 17th from 2-4 pm. Take a relaxing trip on a pontoon boat and discover South Florida's nature and history. The trip departs from the Deering Estate. Please arrive by 1:30. To make reservations or for more information, call 305-235-1668 ext. 233. The Town of Cutler Bay will hold a zoning workshop at 7pm on Wednesday, February 13th, at Cutler Ridge Park, located at 10100 SW 200th St.
"Stella" has been missing from the vicinity of Tiffany Dr and 93rd Ct for about 1 week. If you have any information, please email us. This Tuesday, February 12th at 6:30pm, join the South Florida Writer's Association presentation of an �Evening of Poetry & Opera. The event takes place at the Deering Estate with a cheese reception beginning at 6:30pm and the program beginning at 7pm. The event is free with the price of general admission which is $7 for Adults; $5 for children 4-14. On February 9th, beginning at 7pm, the Hearts United Foundation will be holding a casino themed fundraiser to raise money to host a medical conference in June for children with heart defects. Tickets start at $50.00 and include a buffet, open bar and gaming tokens. The event takes place at the Palmetto Bay Village Center, located at 18001 Old Cutler Rd. For more information and to buy tickets, visit www.heartsunitedfoundation.org. Saturday, February 9th beginning at 11 am. Visit the Deering Estate for a tour of ArtSo Bay Exhibit and Lunch with David Castill. Tour begins at 11am with lunch following at noon. Cost is $30 for non-members and $25 for foundation members. Saturday February 9th. Kids will have a blast at The Fruit and Spice Park making their own pizza. They will learn to plant and care for the various herbs used in cooking while creating their own masterpieces. Cost is $10.00. Register early by calling 305-247-5727. On Sunday, February 10th, at 6pm, visit the Deering Estate for a classical piano recital by Jose Lopez. Cost is $25; $20 for foundation members. Autism affects 1 in 150 children. The Miami-Dade Walk Now For Autism will be held on February 10th at Crandon Park on Key Biscayne. The walk raises funds for autism research and also serves to raise autism awareness. To donate, volunteer, or for more information, go to www.walknowforautism.org/miami. There will be a re-election fundraising reception for council member Ernie Sochin on February 4th, from 6:30-8:30pm at Melao Grand Cafe, 18415 S. Dixie Hwy (former R.J. Gators location). Complimentary food and beverages. NOTE: We consider fundraisers, etc. Cutler Bay "events" and will publish submitted events for ALL candidates running for office in Cutler Bay. The Concerned Citizens meet on the first Tuesday of the month at 7pm at Cutler Ridge Park. The next meeting is scheduled for February 5th. These meetings are free and open to all Cutler Bay residents. There will be a "Meet The Candidates" question and answer forum for the Council Seat 2 candidates. Both incumbent councilmember Ernie Sochin and challenger Kevin Woitke have agreed to participate. All Cutler Bay residents can vote for these candidates, not just the residents in Seat 2. The Concerned Citizens are planning to hold a similar forum for the vice mayoral candidates in March. At the December 19th town council meeting, the town council passed a resolution to pursue steps toward becoming a Green Local Government, a designation given by the Florida Green Building Coalition for outstanding environmental stewardship. The County Commission gave final approval last Thurday to allocate $20 million dollars to Cutler Bay for road improvements on Caribbean Blvd and on Old Cutler Road. Improvements may include a center turn lane, medians, sidewalks and bike lanes on Caribbean. Two traffic circles, improved bike path and road resurfacing is planned for Old Cutler Road. Our thanks to Commissioner Katy Sorenson, Mayor Paul Vrooman, and Town Manager Steve Alexander for all their hard work fighting for this funding. Thursday, January 31st from 7 to 9pm. Commission Katy Sorenson will host a Foreclosure Prevention Workshop at the South Dade Government Center, Room 203. The workshop aims to assist residents who are facing foreclosure or who are having financial difficulties. In addition to presentations on predatory lending, mortgages, credit management and homeownership, homeowners will be able to ask questions and have a one-on-one consult with a finance expert. The forclosure prevention process will be started immediately for qualifying residents. Homeowner should bring their driver's license, Social Security information, and recent mortgage statements for all properties. For more information, contact Alfie Sergio at 305-378-6677 or by email. The government center is located at 10710 SW 211th Street, in Cutler Bay. This Thursday, January 31st at 7pm. South florida artists will showcase their work in a variety of artistic mediums. In addition, The Miami String Project, will perform. The event takes place at the Deering Estate and is free to the public. Visit www.deeringestate.com for additional information. At the Deering Estate on Saturday, February 2nd from 9am-noon. Kid's can learn to make paper sculptures from artist-in-residence Pepe Mar. For ages 6-10. Cost is $30. Visit www.deeringestate.com for additional information. On Saturday, February 2nd from 8am-5pm, Mercedes-Benz of Cutler Bay will be holding a job fair to staff the town's newest dealership. They will be accepting applications in all areas including sales, service, parts, customer service, and administration. The dealership is located at 10701 SW 211 St.(at Southland Mall). For more information, visit www.mbcutlerbay.com. You can give voters a direct voice in changes in their local government's land use. Sign the Florida Home Town Democracy Petition today. Visit http://floridahometowndemocracy.com for more information. Included on the ballot, are admendments to allow homestead property owners to transfer up to $500,000 of their Save-Our-Homes benefits to their next home, placing slot machines at paramutual locations, along with voting for the presidential primary. For sample ballots and a list of Cutler Bay polling locations, visit our voting page. This Tuesday, January 29th from 6-8pm. This seminar for the small business owner covers how to plan small scale events to promote your product or service. This free workshop takes place at the South Dade Regional Library, located at 10750 SW. 211 St. For more information call 786-388-9040 or visit www.fausbdc.com. Is your child having difficulty in school? The South Dade Regional Library offers an ongoing tutoring program for students in grades K-12. The next session is Saturday, January 19th from 10am-1pm. For additional information call 305-233-8140. The South Dade Regional Library is located at 10750 SW 211 Street, in Cutler Bay. Early voting began on Monday, January 14th, for January 29th voting. Included on the ballot, are admendments to allow homestead property owners to transfer up to $500,000 of their Save-Our-Homes benefits to their next home, placing slot machines at paramutual locations, along with voting for the presidential primary. For sample ballots, Cutler Bay polling locations, and the early voting schedule, visit our voting page. January 26th from 10am-5pm at the Orange Bowl Stadium. This event is to honor the stadium's 70 year history in South Florida. The event features a flag football game starring Dolphins Legends vs. Hurricane legends. Free autographs all day. General admission is $20.00. for tickets visit www.orangebowlstadium.com. Saturday, January 26th and Sunday, January 27th. Visit Fairchild Gardens for their 2nd annual International Chocolate Festival. Learn how to make chocolate, discover the rich history of chocolate and most important, sample savory chocolate delights. Visit the Chocolate Spa and explore the rainforest to learn how chocolate grows. Enjoy music and children's activities. For more information visit www.fairchildgarden.org or call 305-667-1651 ext. 3344. Saturday, January 26th, from 8am-4pm. Learn more about going "green" at the Tropical Green Festival taking place at the Coral Gables Youth Center. Listen to lectures and see exhibits about green living, eco-friendly products, saving energy and money and organic foods. The Youth Center is located at 405 University Dr., Coral Gables. Phone 305-325-0045 for additional information. The event is free. On Saturday, January 26th from 12:30-4pm, take advantage of free health screenings, for blood pressure, blood sugar, cholesterol, bone density, and more during Baptist Hospitals 17th annual Womans Health Day. See demonstrations, and listen to mini- lectures. Author Mary LoVerde will present "Strategies for a Balanced Life" from 1-2 pm. Enjoy fitness demonstrations, chair massages, and drawings for gift baskets. The event is free. The hospital is located at 8950 N. Kendall Drive. This Sunday, January 27th from 10am-6pm. Visit Jungle Island for their Family Adventure Day. Enjoy great circus performances, shows, petting zoo, rides at no extra charge. For more information and discount coupons for $6.00 off admission, visit www.familyadventureday.com or call 305-672-1156. On January 22nd, at 7pm, the Whispering Pines Civic Association presents Cutler Bay Seat 2 Councilmember Ernie Sochin and Vice Mayor Ed MacDougall at Whispering Pines Elementary School. The vice mayor and councilmember will be speaking about Cutler Bay town issues and will take questions from the audience. Refreshments will be served. Beginning in February 2009, older TV's will not work with the newer digital system without a converter box. Consumers can receive a maximum of two $40 coupons per household to help offset the cost of a converter, which is expected to cost between $50 and $70. To request a coupon call 1-888-388-2009 (1-888-DTV-2009) between January 1, 2008 and March 31, 2009, or go to www.dtv2009.gov. Coupons which will be mailed out starting in mid February, and will expire after 90 days. On January 18th, 19th, and 20th, join the fun as Our Lady of the Holy Rosary catholic Church presents Carnevale Holy Rosary, a multi-cultural festival. Enjoy midway rides, international foods, D.J's, live music and a variety of other entertainment. Raffle on Sunday includes a $1000 first prize, other prizes are a Nintendo Wii and an iPod. Free admission and parking. Unlimited ride wristbands available through 1/16/08. Call 305-235-5135 or 305-235-5442 for more information. The Carnevale begins on Friday at 6pm, Saturday and Sunday at 11 am. The church is located at 9500 SW 184th Street (the corner of Eureka Drive and Franjo Road). This Saturday, January 19th from 1-3pm, visit Southland Mall for a fun-filled day of painting and crafts from Ceramics on Wheels. Do You Want To Run For Office In Cutler Bay? The Cutler Bay Town Council election will be held on March 11th, 2008 for the positions of Vice Mayor and District 2. If you are planning on running for either office, qualifying dates are from noon January 2nd through noon January 15th. Visit the town elections website for additional information. Saturday, January 12 and Sunday January 13th from 10am-5pm. Visit Pinecrest Gardens for their fine arts festival featuring a variety of mediums and prices from nationally recognized artists as well as local artists. The garden is located at 11000 Red Road, in Pinecrest. For more information visit www.pinecrestgardens.com. January 12th and 13th, from 10am-5pm. Visit the Fruit and Spice Park for this annual festival featuring local arts and crafts, tropical plants, food, and children's activities including a petting zoo, pony rides, puppet and magic show, and Everglades reptile show. Admission is $6.00 for adults, free for children under 12. The park is located at 24801 S.W. 187th Avenue. Homestead, Phone 305-247-5727. Sunday, January 13th at 4pm. Hear Kosher Gospel Singer Joshua Nelson in this joyous spirited concert. The Temple is located at 7500 SW 120th Street. For additional information visit www.betshira.org/. On Saturday, January 12th from 9am-noon. Children ages 6-10 can visit the Deering estate for a program that shows the contrast between the salt marsh and the mangrove environments. Students will learn the different adaptations of these plants and their role in mature and the benefits they provide. Cost is $30. per child with a one-time annual registration fee of $10. For additional information phone 305-235-1668 ext. 233. On Saturday, January 12th from 10am-noon, the Deering Estate will host a class on how to construct a rain barrel. Cost for the workshp and rain barrel is $40 and $10 for the workshop only. Pre-registration and pre-payment is required. For more information, call Christian Miller at 305-248-3311 x 230 or visit. Monday, January 7th through Friday, January 11th. Miami-Dade students will be displaying their science projects throughout Southland Mall. The first Cutler Bay charter committee review meeting will be held at 7pm on Thursday, January 10th, at Cutler Bay Town Hall, located at 10720 Caribbean Blvd (South Dade 2 Building), Suite 105. The Deering estate is now offering kayaks for rent on Saturdays from 10am-3pm. You must be at least 21 years old to rent. People between the ages of 9 -20 must be accompanied by an adult in the same kayak. Rates are $10 per hour for adults, $8 for children ages 9-15. Minimum 1 hour rental. For more information, phone 305-235-1668 ext. 233. Starting Wednesday, residents can drop off undecorated Christmas trees at the The Eureka Drive Trash and recycling Center, located at 9401 SW 184th Street (map), or any of the other local neighborhood trash and recycling centers. The trees can be dropped off daily between 7am and 5:30pm. The trees converted to chips for garden and landscaping needs, which will be available free of charge at the Eureka Drive Center, beginning in February. Looking for somewhere new to eat. 5 new restarants have recently opened in Cutler Bay. "Rumors", a new neighborhood Bistro and Bar with steaks, pork chops, churrasco, poultry, pasta, seafood and much more has opened at the Old Cutler Towne Center (at the former site of OCs). Also open at the Towne Center, "Wing Stop", with 9 different flavors of wings. In addition, "Johnny Rockets", "Charcoals" and "Stir Moon" have recently opened at the Southland Mall. Please patronize our local restaurants. A zoning workshop will be held at 7pm on Wednesday, January 9th, at Cutler Ridge Park, located at 10100 SW 200St. Read the agenda for the workshop. There have been numerous products recalled lately due to safety concerns. For information about recalled foods and medicines, visit this FDA webpage To locate information regarding children's products, including toys visit www.cpsc.gov. The presidential primary election and tax amendment vote is on Jan 29, 2008. Stop unwanted political phone calls by registering your phone number at www.stoppoliticalcalls.org. Planning your New Years resolutions? Why not make a bigger effort to recycle your newspapers, plastic bottles, aluminum cans, glass bottles and other items. For some quick facts about the benefits of recycling visit www.miamidade.gov/dswm/library/recycling_quick_facts.pdf. Find out what items can be recycled. If you need new bins, order them on-line by visiting www.miamidade.gov/dswm/bin.asp or call 305-633-3100. You can dispose of home chemicals and used electronics at the the South Dade- Permanent Home Chemical Collection Center, located at 24000 SW 97th Avenue (South Dade Landfill), Gate-B. Dog lovers rejoice. The neighboring Village of Palmetto Bay had the grand opening of Wayside Dog Park on November 17th from 10am-noon. The park is located at 16425 S. Dixie Hwy. The 3 acre park is completely fenced with two sections for different sized dogs. The park features water fountains, benches, picnic tables, walking path, waste collection stations and a small gazebo. All dogs must have proof of current license and vaccinations. Thursday, January 3rd from 7 pm-9 pm. Discover the Deering Estate after dark as you take a guided hike through the natural areas enjoying the cool South Florida winter. The hike is free with paid park admission. Adult admission is $7.00, Children 9-14 $5.00. For more information phone 305-235-1668 ext. 233. At the Miami Seaquarium from December 26th through January 5th. Enjoy a magical snow falls every 15 minutes, a Winter Village with thousands of holiday lights, the Kid's Winter Express Train, Holidays Around the World display, fireworks and much more. The park hours are extended from 9:30-8:30pm. For additional information call 305-361-5705, ext. 225 or visit www.miamiseaquarium.com. Visit Perrine-Peters United Methodist Church for their nativity scene exhibit. The exhibit is open from 11am-1pm Tuesdays and Thursdays, 1-3 pm Saturday and Sunday through Janurary 6th. The Church is located at 18301 S. Dixie Hwy. Phone 305-235-2309 for additional information.